One Sheet Pan Dilly Lemon Salmon only takes 15 minutes to make; easy enough for weekdays and fancy enough for guests. 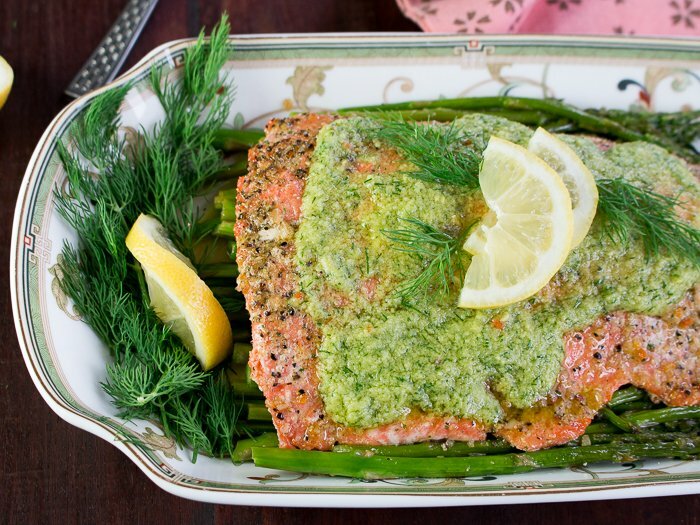 Light and delicate baked salmon and roasted asparagus topped with a creamy dreamy dilly lemon topping with NO eggs. You heard us right - NO EGGS! 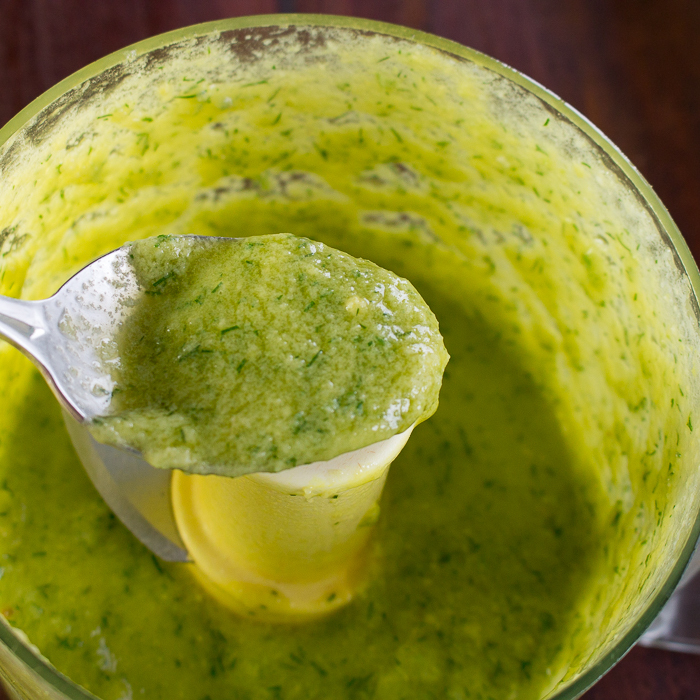 What is the secret ingredient that makes this eggless dilly lemon aioli so creamy? Can you guess? Avocado is the secret ingredient that makes this dilly lemon aioli so thick rich and creamy. Healthy monounsaturated fatty acids and over 20 vitamins and minerals make this delicious stone fruit a health packed nutritional choice. 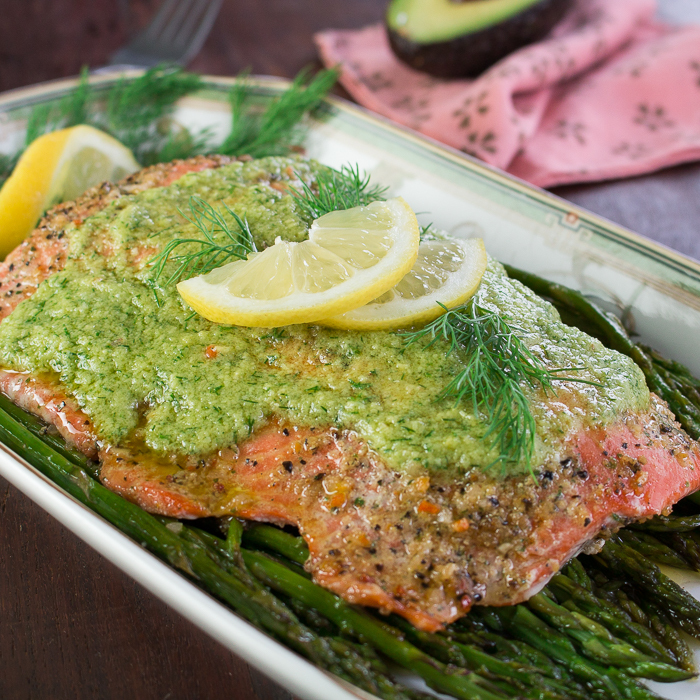 Avocados are high in fat but the good kind of fats that help lower your cholesterol all while making a rich and delicious killer good dilly lemon sauce for your salmon. 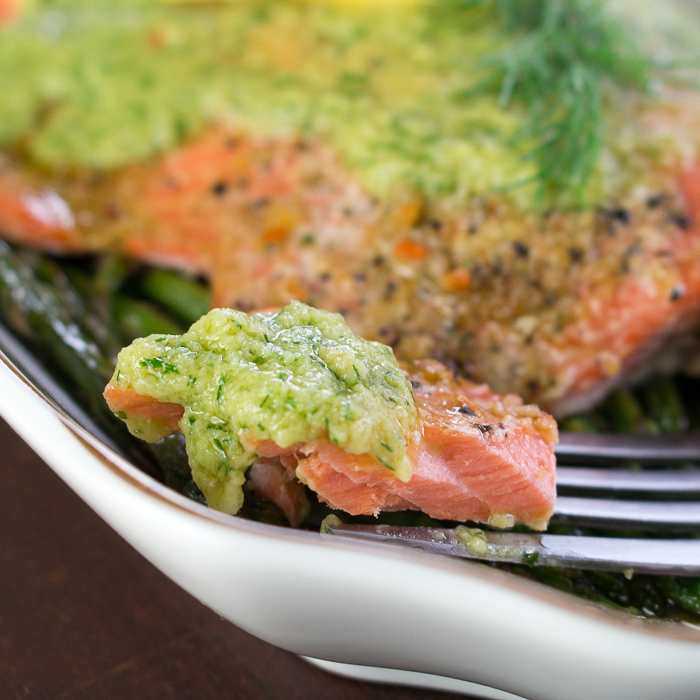 We chose a wild caught salmon for maximum omega-3’s to prevent cancer. We put in a whole 3 cloves of garlic in our Dilly lemon sauce to keep aware the vampires. Just checking to see if you guys are following along. 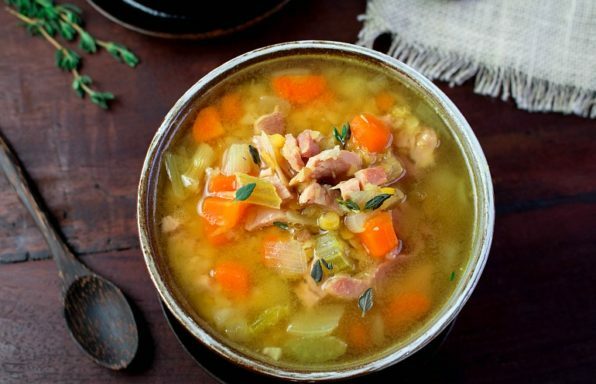 Did you know that things that grow together in season, taste amazing together? Delicious sweet asparagus and avocados are both in season and this whole dish is very rounded. 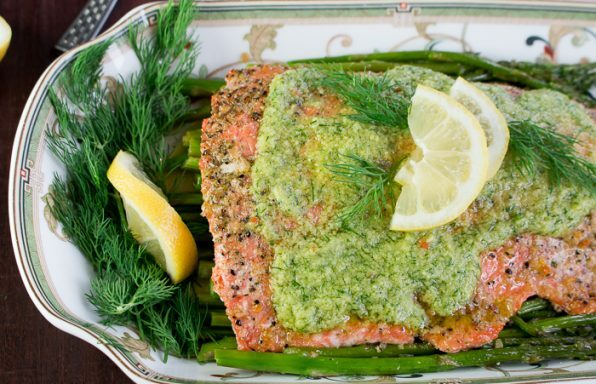 The sparkle from the lemon and the herby dill compliment the healthy fats in this One Sheet Pan Dilly Lemon Salmon. We threw this One Sheet Pan Dilly Lemon Salmon together and it was baked in 15 minutes. Yes, 15 minutes. Don’t you just love one pan sheet meals! Did you see our INSTAGRAM video? We were totally planning on grilling outside when the heavens opened up. 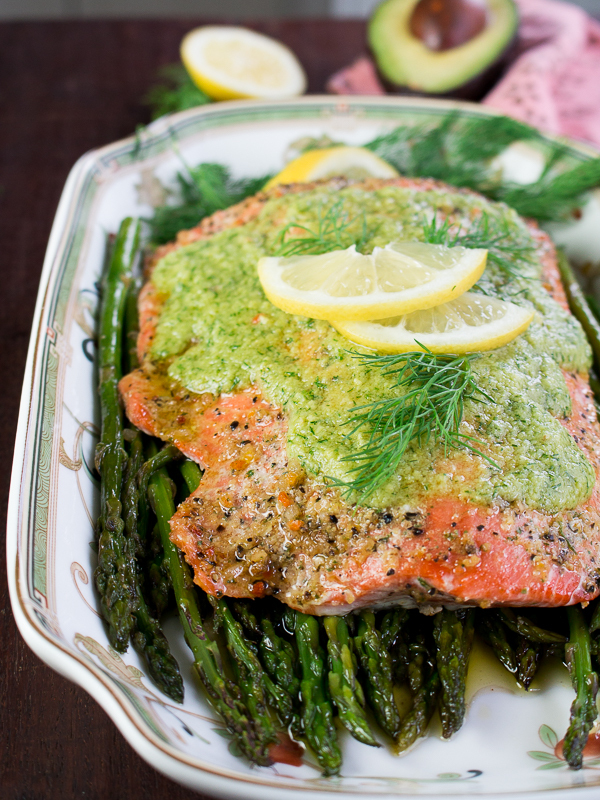 This delicious One Sheet Pan Dilly Lemon Salmon is fantastic on the grill or in the oven. Who knows what "Mother Nature" will be up to on the holiday weekends so you need a back up plan. Just a 5-minute prep of placing your salmon and asparagus on your sheet pan, drizzle with a little olive oil and sprinkle with a little Mrs. Dash or salt and pepper to taste. 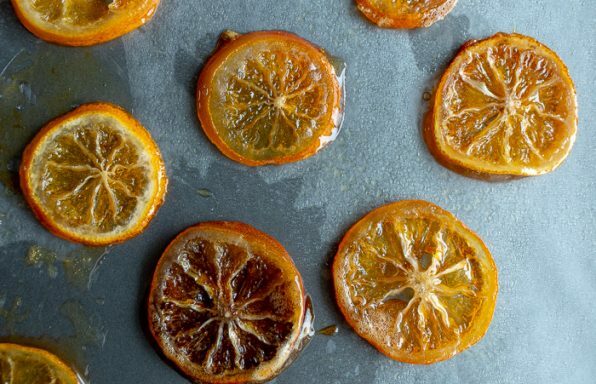 Whack it in the oven and make your dilly lemon sauce and you are ready to go. Now 15 minutes does not include the clean-up, photography or sharing on Instagram while our family is screaming is it done yet. Only 15 minutes from sheet pan to table. If you are in the mood for fish, have you tried our Baked Cod Parcels with Black Bean Sauce, Baked Skinny Tex Mex Fish, Halibut Coconut curry in a Hurry, Spicy Citrus Baked Salmon Packets or our Crab Stuffed Whitefish? All of these fish recipes clock in at less than 1/2 hour. 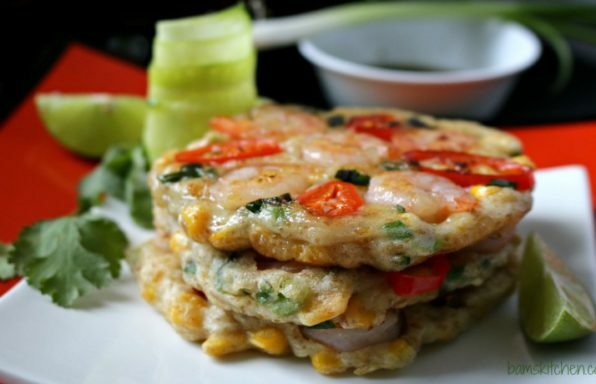 They are simple enough for a week night meal but fancy enough for entertaining. 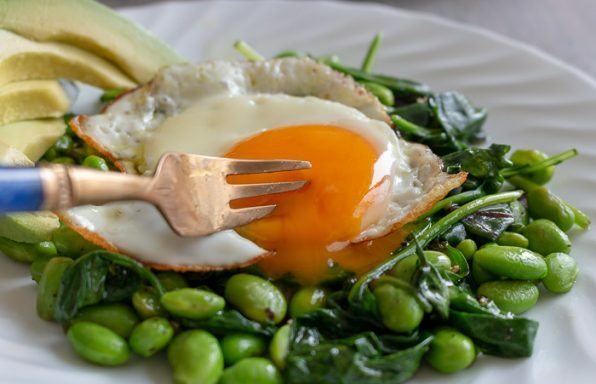 When you eat healthy fats in your meal, it is so much easier to just skip the carbs. Healthy fats make you feel full longer and not deprived. How many of you are trying to cut sugar and carbs? It is insane how many places that sugar, corn syrup, dextrose, etc. etc. ends up in food items. Just looking on the back of a jar of sunflower seeds as we are typing this post up and there is corn syrup in the sunflower seeds. WHY? Really? Shopping the external isles of the grocery store and enjoying lean meats, fish, veggies and loving it. 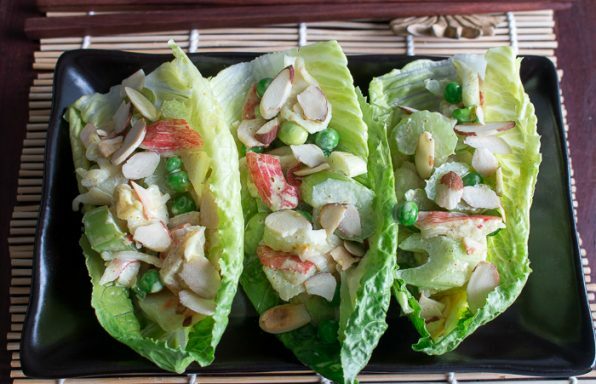 We have many more low carb and sugar free recipes coming your way. 3Place your skinned salmon on the sheet pan and add your asparagus around the salmon so they are in a single layer. 4Drizzle olive oil over asparagus and salmon and season with Mrs.Dash seasoning or salt and pepper to taste. 6In the meantime, make your dilly lemon sauce. Place your garlic, olive oil, lemon juice, avocado, salt and dill in your food processor and blend until smooth, about 1-2 minutes. 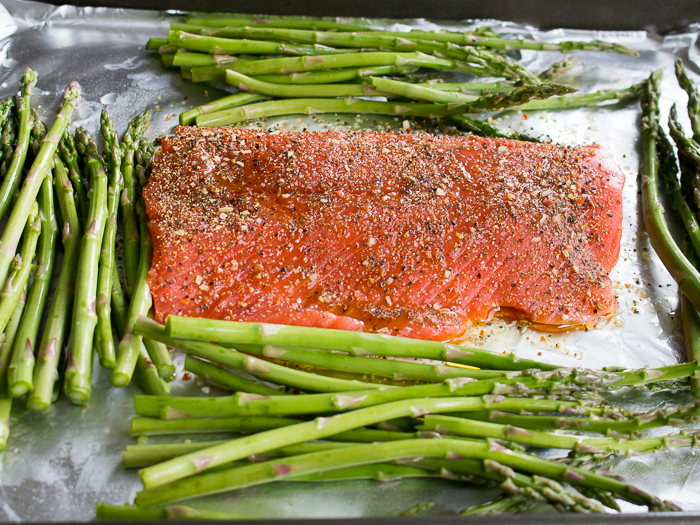 7Remove your salmon and asparagus sheet pan from the oven. Drizzle the dilly lemon sauce over the salmon.